It was a dark and stormy September day…sounds like the start of a good horror story, huh! It could have been because I needed some barbecue sauce. And I didn’t want to go out in the rain. Now, a lot of quickie barbecue sauces start with ketchup, but that wasn’t going to work for me. Because no Barbecue Sauce and no Ketchup. In. The. House. Bummer. Luckily, I remembered this wonderful little barbecue sauce from Magnolia Grille. It’s meant to be served with their Grilled Pork Chops (another post, perhaps – they’re so simple & so good) and this sauce is a gorgeous thing napped across them – the little bits and pieces of this and that makes it almost like a barbecue salsa. A thin North Carolina Barbecue salsa, that is. But today, I’m going to blend it all together into a more cohesive sauce. It’s still not very thick, but perfect for the bit of leftover chicken I wanted to toss in it. You’ll love it, either way, I promise. 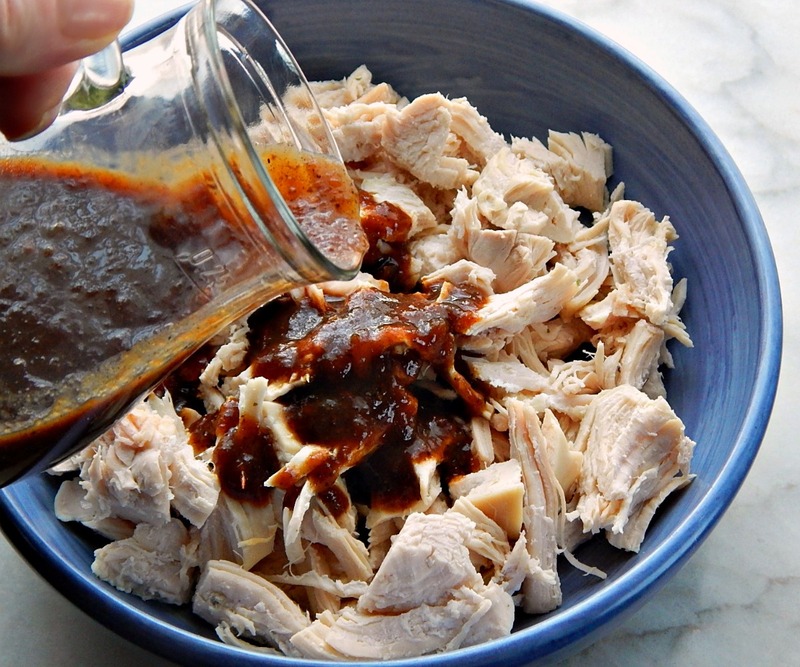 This is simple (for a barbecue sauce) and easy, but don’t let that fool ya. The flavors are complex – I blame the dates in this. Oh, and the molasses. Or maybe the wine. Different but different good! It has a smoky, deep hot sauce kind of taste. I did do quite a bit of adapting, so here’s the original, if you’d like to see it. Combine all ingredients except brown sugar, salt and pepper in heavy large saucepan. Boil until reduced to about a cup, stirring occasionally, about 20 to 25 minutes. Remove to a blender and blend until desired consistency; a little texture is nice. Taste, add sugar if desired. Season with salt and pepper. Will store well for several days, covered in the refrigerator. May be prepared ahead. Can be served cold or warm. And by the way, this Pizza is another thing I need this barbecue sauce for. We love it! I’ll also be sharing this recipe on Fiesta Friday #138 , Angie’s Link Party – and I’m hosting this week with the incomparable Johanna of French Gardener Dishes. This entry was posted in Click here for Fabulous Food Posts and tagged Barbecue, Barbecue Sauce, Condiments, Dates, Magnolia Grille, molassas, north carolina barbecue sauce, Tomatoes, Vinegar, Wine. Bookmark the permalink. nice post i might have to try this !! keep up the great work!! I don’t think anyone likes it by itself, but in gingerbread, or in this, it’s a whole different thing. I can’t believe people used to use it for a sweetener!! And I think I do play with my food a lot! Wrong – my husband loved it on biscuits and ordered it special from somewhere in the South. This nephew does not like the seasonal gingerbread and other goodies and we found the common denominator was the “molasses”. Wow! Molasses is sooooo potent! How funny, but I’m tickled to hear it!